In the effort to keep the border of the United States safe and secure, the importance of monitoring and governing the types of plant and agricultural products that enter the country cannon be overstated. U.S. Customs and Border Protection Agriculture Specialists fill the often overlooked but vital role of safeguarding the U.S. economy against threats to the economy and ecosystem. According to the U.S. CBP, the number of flowers, vegetables, fruits, herbs, and other plants and produce that enters the United States measures in the millions of pounds. What few people realize, understand, or appreciate is the fact that some of those agricultural items could potentially pose a serious threat to the U.S. farm system. Plant life can carry agriculture-destroying bugs or other organisms and diseases that, if they got into the country and had an opportunity to spread, could severely damage the U.S. food supply or otherwise impact the agricultural system. These pests include invasive insects and wood-destroying pests that could significantly impact native forests and farms. The job of a Customs and Border Protection Agriculture Specialist is to identify those threats and keep them from making their way past the borders. 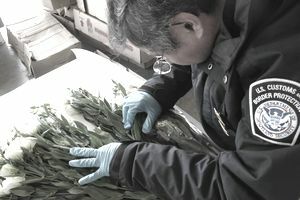 CBP agriculture specialists look for potentially dangerous or suspicious plant life, and then inspect, test, and destroy them as necessary. They also help educate travelers about the importance of agricultural safety and explain why certain plants must be intercepted or destroyed. In short, agriculture specialists with U.S. Customs and Border Protection use special equipment and specially trained police canines at ports of entry around the United States to keep the potentially hazardous organic matter out. CBP agriculture specialists wear uniforms and perform shift work, spending many hours on their feet or in uncomfortable positions while they inspect cargo, vehicles, vessels, and luggage. Depending on what level of the federal pay grade system you are eligible for, you can expect to start between the GS 5 and GS 9 pay grades, or between $28,000 and $57,000 per year. Over time, you'll have the potential to promote and earn up to $80,000 per year. To become an agriculture specialist with U.S. Customs and Border Protection, you need to have at least a bachelor's degree, and preferably higher education, in the biological sciences, such as entomology, plant pathology, or botany. Some of the required education can be substituted for experience in jobs such as pest control, aircraft or passenger inspection, farm management and disease control, or other related career fields. To apply for the job, you must be a United States citizen and hold a valid driver's license. Once you've applied, you'll need to submit to a thorough background investigation, as well as a drug test. That means you'll want to avoid common mistakes that could keep you from getting hired in a law enforcement or security career, such as drug use or criminal behaviors. If you are hired, you'll complete up to 12 weeks of training in agricultural inspection in Frederick, Maryland. CBP agriculture specialists are an important part of the effort to keep the U.S. economy safe. Countless people rely on the food and livelihoods that the agricultural industry provides. As a Customs and Border Protection Agriculture Specialist, you can be a part of keeping the ecosystem and the farming industry safe and secure.